Home . Publications . Celebrate a Miracle or Two! Celebrate a Miracle or Two! Today is Election Day in the United States of America and it is a brand new day for every human being who is living, breathing, and has not been terrorized or victimized by the culture of death. In other words, it is a brilliant day no matter the politics of the moment. Yet at the same time, there is a growing awareness that not all is well in America. In fact, as the number of medical abortions is now about the same as surgical abortions, we might say it is a mind-numbing reality that, for too many in this nation, human beings’ lives are not deemed worthy of respect, unselfish love, and affirmation. But still we see miracles everywhere. A miracle occurred in this family thanks to the power of prayer and the love for those babies from the instant their lives began. Yet Jennifer’s peace would have been nonexistent had she chosen a late-term abortion for her three amazing sons. The miracle of love helps a family in a situation like this appreciate what it means to have precious moments with an ill and dying newborn. 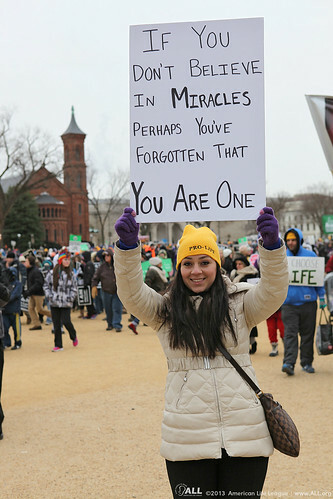 This miracle would have been nonexistent had a late-term abortion been the response to the condition identified prior to birth. Our cultural disdain for alleged problem pregnancies extends all the way to the other end of life as well. Think about Stephanie Packer, a terminally ill mother of four who is suffering from scleroderma and is living on borrowed time. Her doctor told her she had three years to live, yet she is now in her fourth and enjoying every moment she can with her children and her husband. The most shocking part of her story came when her doctors wanted to switch her to a chemotherapy drug that might keep her alive longer. According to the New York Post, “Her medical insurance company refused to pay. She says she asked if the company covered the cost of drugs to put her to death. She was told the answer is yes—with a co-payment of $1.20.” And that, my friends, is what the culture of death is really all about: killing the preborn, the terminally ill, the “imperfect,” and anyone else deemed unworthy of life. Stephanie Packer is a living miracle. She chooses life every single day and has defied those who would prefer to pay for her death. Though we constantly see bad news, we must realize that there is also good news everywhere. All we have to do is look for it. This is why we encourage you to learn about these miracles and help build a culture of life with our Culture of Life Studies Program. We offer educational tools such as Euthanasia: An Introduction, the Life Is Precious unit study, and many others that help teach respect for all human beings. By instilling respect for the dignity of the human person in our children from the time they are old enough to learn, we are changing the culture and building a culture of life. Do not focus on the darkness, the evil, and the night. Celebrate the miracles and make more of them right in your own home.